A Tegnap Varosa: A nagyvaradi zsidosag emlekkonyve, is the Memorial Book of the Jews of Nagyvárad. It was edited by Dezso Schon, Mose Heller, Sandor Rubinstein, Odon Grossman, Jozsef Greda and Otto Rappaport and published by Grosswardein Society in Israel, 1981, in Tel Aviv. Written in Hungarian, it contains many narratives, photographs, poems, tables and lists of names of those deported from the city. Susan Geroe, of our steering committee, has translated selections of the book into English; these materials are posted in Jewishgen.org. The text and names below appear on p. 388-429. 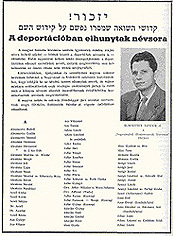 The official Hungarian fascist establishment endeavored to destroy every piece of information that could prove damaging to them later, including the list of names of the deportees. For this reason we had to collect, one by one, the names of our loved ones who perished during the deportations; our list therefore does not come close to containing all the names of those who did not return. In our newsletters, newspapers, and by personal contact, we asked our brothers from Oradea and surrounding areas to submit the names of people known to them who perished. Unfortunately, our efforts were only partially successful and therefore we were able to assemble only this incomplete list to honor the names of our relatives, whom we will never forget. The late Sandor Rubinstein, General Secretary of our organization, performed this difficult and very tiring task with self-sacrificing devotion. GOLDSTEIN KUBINE, NEE KLEI T.
LANG SAMUELNE, NEE GRUN E.
Sandor Rubinstein, General Secretary of the Organization of Descendants from Oradea.